miniature equipment from GELD general electric language districts. 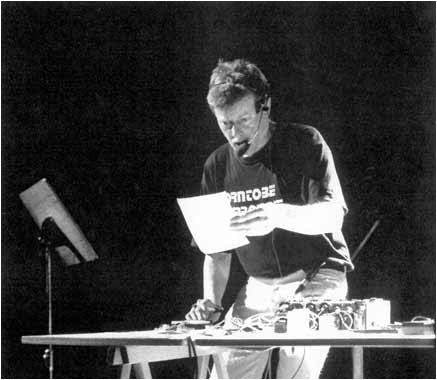 with a pencil which is filled with electrodes the performer will be writing/drawing/scribbling on a wet thin board. zapping tapes with thousands and thousands of cuts, crap from the TV in all registers conceivable, so that the own voice/text is going to fade away in the panorama between the loudspeakers. to mix further tapes simultaneously an optical mixer (optocouplers) will be controlled via a headset microfone. by moving the fingers on the wet 'keyboard' the own voice, electromagnetic fields from the motors of the walkpersons, radio headphones (noise) or the fifty hertz humming etc. will be transmitted to open circuits whereby a defective walkperson will be serving as a scratcher. the instructions for the performance are quite structured. but playing the tapes, the outcome is beyond the performer's control. you may call it tronic poetry. Further information about the work of Jörg Burkhard on the website of Peter Engstler Publishing House. You do need a player that is capable of playing the sound sequence.